Kansas City, Mo. 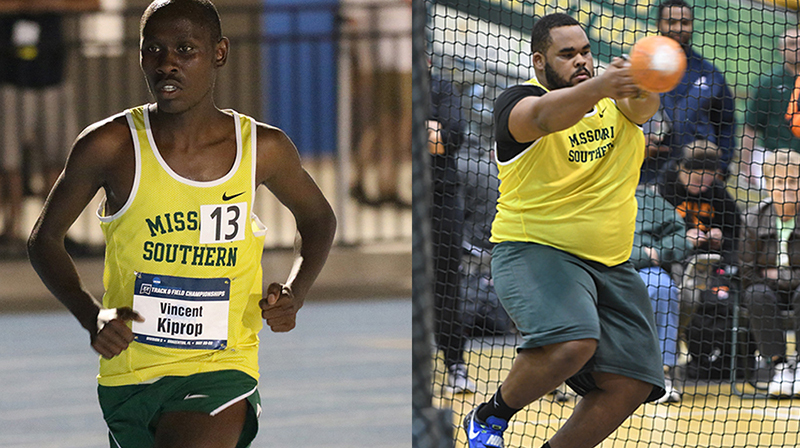 — Missouri Southern men’s track and field athletes Vincent Kiprop and Bryan Burns have been named the MIAA Men’s Track and Field Athletes of the Week, the league announced today. Kiprop shares Track Athlete of the Week honors and Burns keeps the honors all to himself. At Pittsburg State, Kiprop (Kericho, Kenya) broke his own 3k record by more than 13 seconds as he placed second with a time of 8:04.04. That mark ranks second nationally, and tops in the MIAA. Burns (Carthage, Mo.) broke his own shot put record as he finished first with a provisional distance of 59-04.75. That mark is is nine inches in front of his old mark and ranks second nationally. Burns also had a strong day in the weight throw as the junior also threw a distance that would have broken the MSSU record had his teammate not thrown further. Burns placed third with a provisional mark of 62-07.75 which is Division IIs 12th-best. The Lions are back in action this week as the team will have split squads at both Nebraska and Central Missouri.